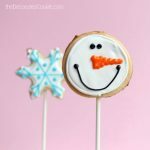 Sparkly, colorful snowflake cookies are a beautiful decorated cookie idea for winter and Christmas. 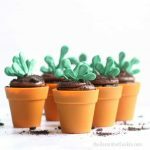 You may remember this Spring when I joined 18 other creative bloggers in the Let’s Smell the Flowers cookie challenge at Haniela’s. I made these carnation flower cookies. Well, Haniela’s invited me back for the holidays. 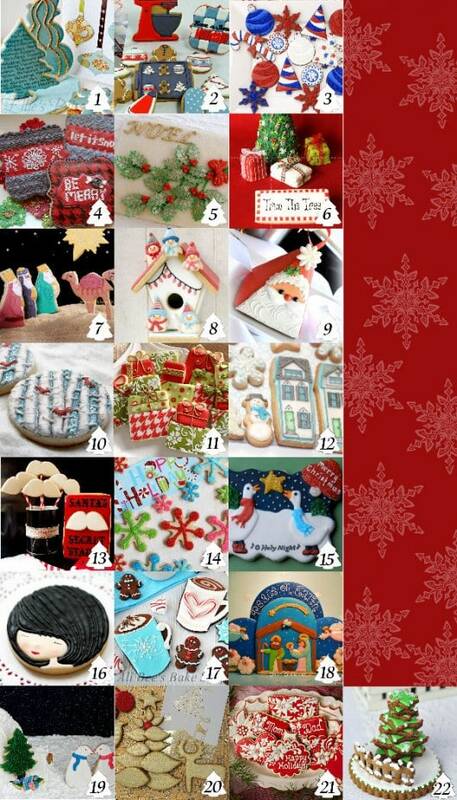 This time, the challenge was to pick a Christmas card to use as inspiration for cookies. Below is the collection of all the amazing Christmas card-inspired cookies. 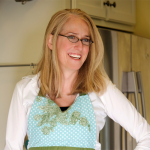 Scroll to the end for the links to the bloggers’ posts! I chose to make bright and colorful snowflake cookies for Christmas. I wanted something with sparkle. Because I love sparkle. 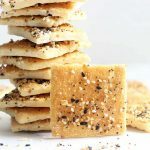 I’ve mentioned a jillion times on this blog how much I love sprinkles, not just for said sparkle, but because they are such a fantastic decorating tool for cookies. 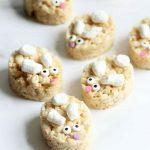 They add dimension and interest to the simplest cookies. And bonus, you needn’t be a cookie decorating expert to decorate with sprinkles. Sprinkles cover icing blips and errors, and they eliminate the need for two different consistencies of icing, because sprinkles cover the lines. While fun and challenging, after spending years at a cookie shop decorating intricate, crazy, and bizarre cookies that take much research and labor to craft (think major appliances, human organs, inside jokes, anything you can imagine drawn on a cookie, I’ve put on a cookie), I have entered into a way-too-long phase of simple, simple, simple. 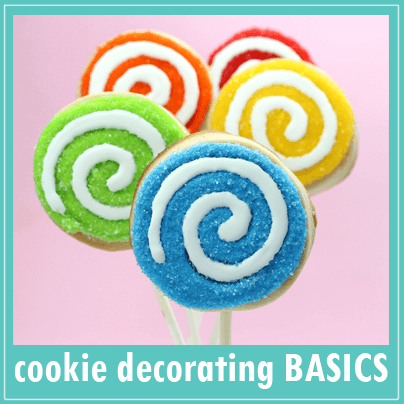 You’ll notice now the cookies I decorate are simple shapes, simple designs, simple colors and simple to re-create. Case in point: These super simple, bright, sparkly snowflake cookies. I found these cards at Target. (Oh Target, how do you never fail me?) I love the touch of sparkle, the mod look and the dominant mix of colors. These snowflakes are decorated merely with three lines and six big dots at the end of each spoke. That’s it. *For food coloring, I suggest Americolor Soft Gel Pastes. Electric Green, Red Red, Sky Blue and Electric Pink used here. Find sprinkles or sanding sugar in matching colors at the craft store. 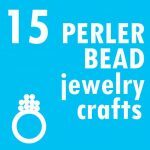 You’ll also find decorating bags, couplers and tips at the craft store. 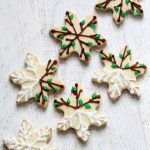 You should find snowflake cookie cutters at the craft store this time of year, but here is a handy link for cookie cutter resources. My cookie cutters were 3 inches and 1 1/2 inches, but you can really use any size you prefer. Here are more resources for supplies. Prepare the cookie dough according to the recipe, chill, roll out to 1/4-inch thickness, cut out your snowflakes and bake according to the recipe. Let cool completely. Prepare the icing according to the recipe, divide and tint your preferred colors. 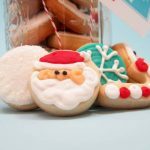 Prepare disposable decorating bags with couplers and tips (sizes “4” or “5” depending on the size of the cookies), fill with the icing colors and close tightly with rubber bands. Work with one cookie and one color at a time. Pipe three lines to make six spokes. I piped two or three lines side-by-side for each of the three lines to make them a bit thicker. Pipe six big dots at the end of each spoke. Immediately coat with a coordinating color of sprinkles. Overturn to remove excess and rest on a baking tray until dry. Complete with the rest of the cookies and colors, and let dry very well, several hours at least, overnight preferred, before handling and packaging. And now, here they all are. Be sure to visit and say hello to these crazy-talented ladies!! Thanks to Haniela for including me in the bunch! I love love love how these sparkle. I love these beautiful, bright cookies!! 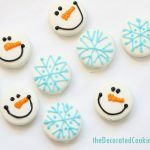 Perfectly fun holiday cookies! Not only do I love sparkle – I love the colors and design of these cookies. They are perfect! Very cute!! It was so much fun doing this project with you! Happy holidays! Love the colors & the sparkle beautiful cookies! love these bright simple snowflakes! they’d be perfect for a last minute cookie. 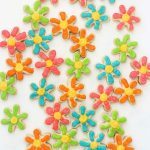 Meaghan, we love this colorful cookies, they’re so adorable! Super cute! I love the fun, bright colors! Such happy cookies! These made me smile and I just adore the colors! What fun it was to be a part of this project! Have a wonderful holiday! I love snow! Your snowflakes are so super cute!! It was fun working on this project with you! Merry Christmas!!! Only you could make snowflakes so bright, sparkly and fun! They make me happy! Megs…you are superwoman. Growing a human, making beautiful cookies, telling me its okay to cover lumps with sprinkles, and making them so darn pretty while you’re doing it! LOVE your card pick and cookie design! Most decorated snowflake cookies you see are white so I’m loving these pretty and ever so sparkly ones you did. Was fun to be *together* again on this project with you. Hope you are feeling well. Excitement must be building! Simple is a wonderful thing! You picked SUCH a fun card for this project!!!! I love how well your cookies match but are still completely your own thing!